However, have you ever considered just how these activities outside of school could aid your child’s development? Well we have and we’ve also come up with a host of games and activities you can do with your child/children this half term, not only for fun and entertainment but to extend their learning opportunities beyond the classroom. It is not always the case that children learn better when they are quiet and attentive. In fact, most children learn best when they are doing something for a real purpose. However, many are confused by the notion of fun learning becoming entertainment rather than development. Tim Taylor, an advanced skills teacher in Norwich, deflates this notion by pointing out that “learning does not have to be boring, nor does it have to be entertaining, but it does have to mean something to the learner”. Encouraging your children to read on a daily basis can result in a wealth of skills. From better communication, grasping the mystery of language, memory, to enhanced concentration and the understanding that reading is fun. For younger children, aged 3 – 7 years old, action games are a great opportunity to improve their reading skills. Many children, especially young boys who are full of energy and find it hard to sit still, can benefit from action games such as outdoor activities. A treasure hunt is an excellent example allowing you to set up a series of written clues they must follow in order to find treasure. Car journeys are also a great chance to engage your children in further development games. So whilst you are on the way to your next play date make up stories, tell jokes, and play I spy to improve their basic understanding of language. For slightly older children, aged 7 – 11 years old, word puzzles such as word searches and crosswords are a great activity to pick up throughout the day, whether on their own or with you, and continue building their vocabulary. Children of the above age group are becoming more independent and allowing them freedom to organise is part of this. Suggest activities such as starting their own club, planning a small party, or organising a garden sale. Whether real or make-believe they are great for communication, language, and organisational skills. Kids love to cook, not only is it a chance for them to get a little messy, but the resulting factor is a selection of delicious goods. Additionally your children can learn a host of skills and lessons through cooking, from science, fine motor kills, sequencing, maths (measurements), and following direction (reading too). They can see what exactly goes in to their food. Learning to count and use measurements. Baking is a science experiment in effect, allowing children to see physical changes when different process are applied. Improved reading by following a recipe. Potentially problem solving – there is a way to save those cookies! Science is perhaps the most exciting lesson for many children with experiments and investigations a core part of the subject. Therefore why not try a few at home for yourself? Under what conditions does chocolate melt? Is it different for dark, milk, and white chocolate? Play with chocolate and study the physical change from a solid to liquid and somewhere in between. Allow your children to put a bit in their mouth and see how fast it melts. What does this tell you about the temperature of your body? One of the most popular science experiments around refers to the diet coke and soft mint geyser. This one is a lot of fun but you’ll need plenty of space so we’d suggest you take this one out to the garden. Stand the diet coke bottle upright and unscrew the lid, add a funnel or tube to the top and drop about half a pack of mints in. Then RUN! If done correctly, a huge geyser of diet coke should come flying out of the bottle. The record is about 9 metres high so give yourself plenty of space. Discuss with your children what chemical reaction causes the geyser. This is a fantastic activity that can span the whole of half term week and beyond. Simply find a world map and place somewhere that is easily accessible. Get your children to find certain countries or ask them about different capitals. Depending on their ages you can get them colouring in the areas of desert, rainforest and ice covered areas. You could help them decide what animals live in each habitat and help them to draw some on to the map. 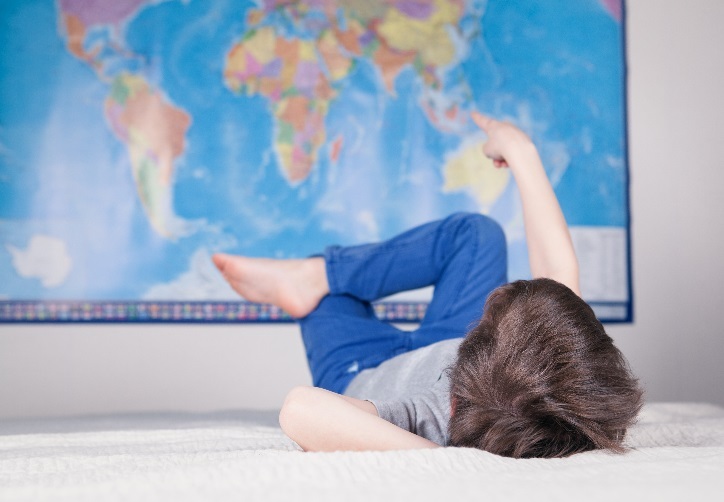 Alternatively, take it one step further and get your child to look around the house and find items originating from other countries. Whether clothes labels of fruit stickers get them to make a note of it on their map. Not only does this build for great discussion but it will let them see how and why we are all connected to the wider world. Whether parent or teacher, making learning fun and accessible is a vital part of a child’s development. At school our teachers work hard to achieve these goals and ensure your child is engaged. Continuing the learning at home is a positive reinforcement to help every child to grow in confidence and ability. These types of visual learning activities mentioned above are great for children, and here at Building Additions, we have incorporated these visual aspects into our folding partitions and moveable walls. 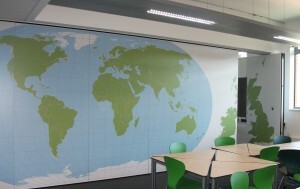 Many schools use these to enable them to use their space more flexibly. 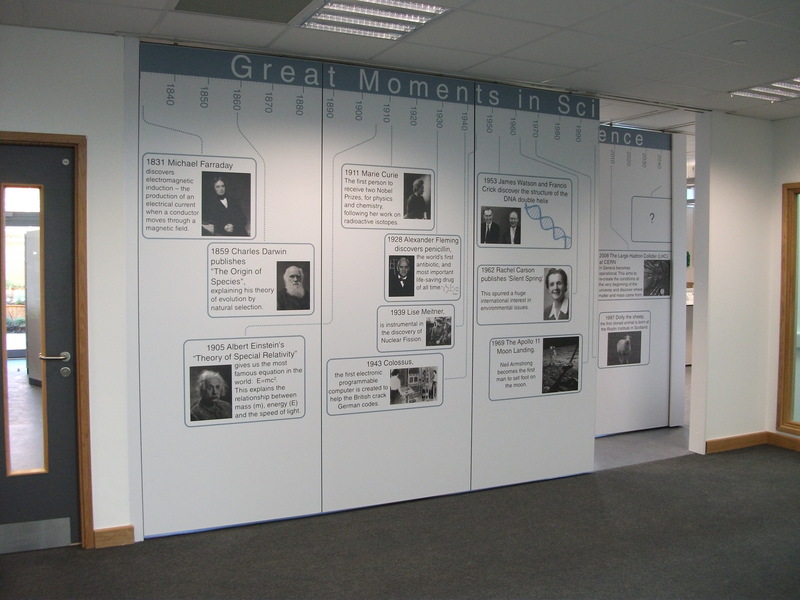 There are a wide range of bespoke finishes available and graphics such as maps can be applied. Give the team at Building Additions a call for more information regarding all moveable walls and folding partitions on 01373 45457.